SodaStream Source has an average rating of 4.4 out of 5 based on 5 user reviews. Comes with the soda maker, a 60L carbonator and a 1L BPA-free plastic bottle. The SodaStream Source is very easy to use and efficient since it benefits from a snap-lock mechanism. Attach the bottle to the soda maker using the snap lock mechanism. Once attached, press down on the block to carbonate the drink. Use the LED Fizz indicator as guidance for the amount of presses. Remove the bottle and poor. The SodaStream Source uses 60L SodaStream carbonators that, as their name implies, allow for carbonation of roughly 60L of water (most users do however report around the 50L range). Empty carbonators can be exchanged for full ones at various retailers such as select Bed Bath & Beyond, Costco, Target, etc. To find a retailer close to you.. Every exchange costs $14.99 but there are cheaper, DIY options. 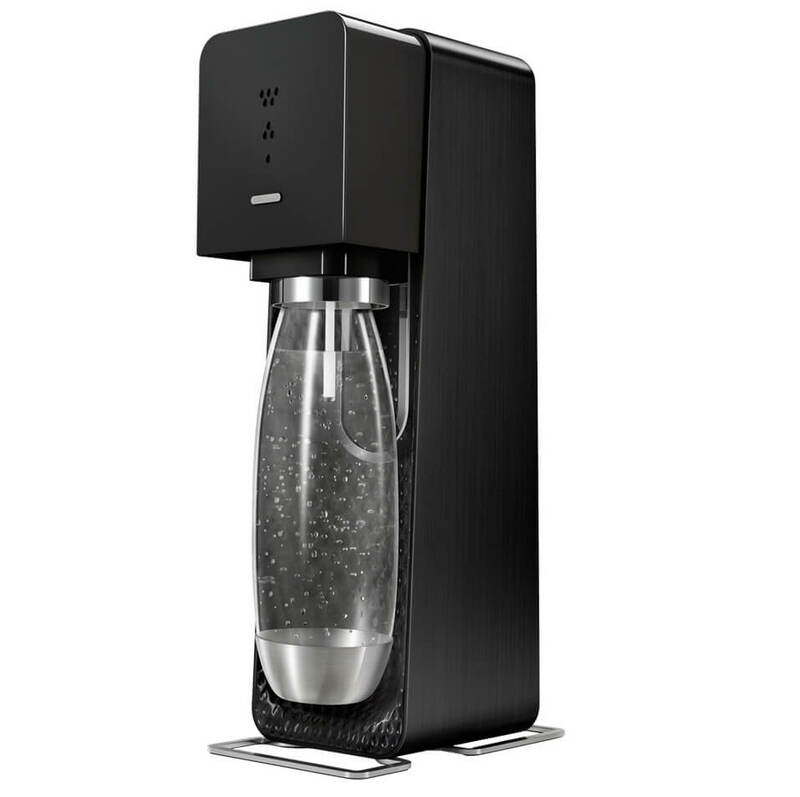 The SodaStream Source differentiates itself through its elegant design (by Yves Béhar), especially in this price range and its ease of use thanks to its snap-lock mechanism. It is also the only soda machine that has a wooden variant. It also benefits from an LED fizz indicator yet retains a minimalist appeal. Many users reported issues with the actual SodaStream Source. First of all, even though it is advertised as not having batteries, it uses one to power the LED lights and this battery is not user replaceable. One consumer’s battery even corroded and leaked into his water. Also, the Source emits a loud squealing noise when used that can become annoying after some time. The lights for some people stopped working after a couple of months and even though they are not absolutely necessary, it removes one of the features of the machine. In addition, many buyers’ starter kits were missing certain parts. On the bright side, users were very happy about the ease of the snap-lock mechanism and the design of the machine. They find that it looks great and is efficient, when it works of course. When I bought this, I didn’t really understand about the CO2 cartridges or the rebate offered with the Source starter kit. I appreciated the rebate but was concerned about the cost of full-size replacement cartridges when I searched for a price(around $30). But don’t worry! After calling customer service I was told to take the empty mini CO2 to a Walmart or Target. They exchange your used canister at the customer service counter for a full-size one, and it costs only $14.99! This machine is used by me every day, and aside from a couple of times I overfilled the bottle, it works as it should. I followed advice from other reviews and got extra bottles to keep sparkling water ready in the fridge. I had an addiction to drinking 4-5 sodas a day. I needed to cut back on sugar, and my doctor recommended I replace soda with flavored water. I tried it, but I missed the fizz, so I decided to try this SodaStream Source and it has exceeded my expectations. It’s so fast and cheap to turn tap water into sparkling water that I now drink more water because the carbonation makes it more satisfying. I do buy the flavored diet mixers, but I find I don’t NEED to have my water flavored anymore. When we go out to eat or visit friends, I take a bottle. Using this with my diet has dropped my a1c levels a lot. Fill the bottle to the line indicated, put in the machine as directed, push the button on top and boom! sparkling water in seconds. The CO2 canister is easy to screw in and out when you need to change it. There is no indicator (other than less/no fizz) to tell you when it’s empty. The unit isn’t electric and comes with two bottles. Keep one in the fridge full of water, so it’s cold when you are ready to carbonate. Leave it plain or add flavorings AFTER carbonation. I have read that people had the indicator lights go out with no apparent way to change the battery, so I don’t know what to do if that happens except call customer service. I am thankful I bought this and I highly recommend it. I bought this a month ago and loved it until I changed out the CO2 can the first time. I don’t know if I didn’t screw it in tight enough, but it lost the gas so the water wouldn’t fizz. I tried a new CO2 can. The water still wouldn’t carbonate no matter what level I set it on. It was the weekend, and customer service wasn’t open. I’m not sure if I damaged the machine with the second CO2 can or if it’s defective. I hope customer service will resolve this issue once I speak with them. Until then, I feel uneasy recommending this until I know what went wrong, since it worked fine at first. I love owning this, so much less waste. It’s easy to flavor the water using SodaStream mixes. It makes tasty sparkling water, though I have a couple of issues. I wish the bottles could be put in the dishwasher, instead of handwashing, and you don’t know when water is at a perfect carbonation level since you manually pump to get the CO2 to release. I hate having a barely bubbly drink or over-carbonate and have to wipe the counter because they don’t have a tray built in at the bottom to catch spills. I have been using my machine for five months, and I recommend this if you consume lots of sparkling water. No more lugging cases of cans and bottles from store to home. Less trash because you use the reusable bottles that come with the SodaStream. I typically use one carbonation canister every month or so then go to my local store that exchanges SodaStream CO2. You can order online, but many retailers now carry canisters and other SodaStream supplies which is convenient. The first canister that came with the starter kit was mini, then you replace that for a full-size for $15. A good investment if you do drink a lot of sparkling water.